It is about ten hours before I again get to hear that first “official” thump into Tampa Bay Rays starting cather John Jaso’s glove that signals the official beginning of another fantastic Major League Baseball season for the Rays. It is great that Mother Nature has pleasantly decided to participate this Saturday feast with rising temperatures in the high 70’s with a possibility of a cooling breeze slinking through the stadium. The anticipation of that warming heat from that big orange ball in the sky is already making this first day of real baseball grand, especially considering our opponenets seasonal town, Pittsburgh, Pennsylvania is experiencing mid-30’s chill with some sort of white stuff on their own ballfield. Hate to admit it to the baseball world, but I am a sentimental old fool when it comes to the game of baseball. Some say I am too emotionally and mentally attached to the game and that has produced some interesting flashbacks over the last few days. To me, it is just a reminder, or a mental revisiting of some past Rays Spring Training Grapefruit moments that stand out in my mind. There always seems to be a bit of a continual flashback video playing within my mind’s eye right before the game become “official”. These first Spring experiences are extra special moments to me, and seasonal events that always bring a smile to my face. More than a few times in the past two weeks I have flashed back to the Spring of 2003, which involving Rocco Baldelli and how during that season he set the bar high for the Rays rookies to follow. We saw Baldelli’s emerging brilliance on the field that March and began our love affair with him. Combined with the high energy and talent of Carl Crawford, that Spring will always be a benchmark to compare past Spring to the present. Even though that Spring of 2003 did not see a Grapefruit title or even a winning record for the Rays, it set the bar for quality. It set the bar for potential and expectations forever. And not everything rushing through my mind has been a good time. There was a moment on March 19,2005 right after seeing possible future Baseball Hall of Fame member Roberto Alomar trotting off the Progress Energy Park infield for the last time with his head down. On that day, it didn’t donned on me that I might have just witnessed Alomar’s last MLB moment or his last Major League Baseball play. Then within a few hours, Alomar announced to the baseball world he was retiring from the game due to vision and back problems. Funny how that moments beckons to me as we will celebrate Alomar’s induction later this Summer into the Baseball Hall of Fame in Cooperstown, New York. But then sparkling memories like the Spring of 2008 come rushing into my brain like the Gulf of Mexico surf. This was the beginning of the “Magical Season of Rays Baseball”, and their last time training in their hometown of St. Petersburg, Florida. Visions of former Rays pitcher Scott Kazmir predicting while he was rehabbing a elbow injury that the playoff were “in sight” and a the goal of the 2008 team. To this day, I sometimes think that vote of confidence by a Rays player set into perpetual motion that Spring’s firm foundation and cemented their confidence for the entire season. Instantly this team began to win those 1-run games that Spring. Who can forget those emotional games against the New Yortk Yankees that season especially after Yankee farmhand Shelley Duncan was dishing out some baseball justice. 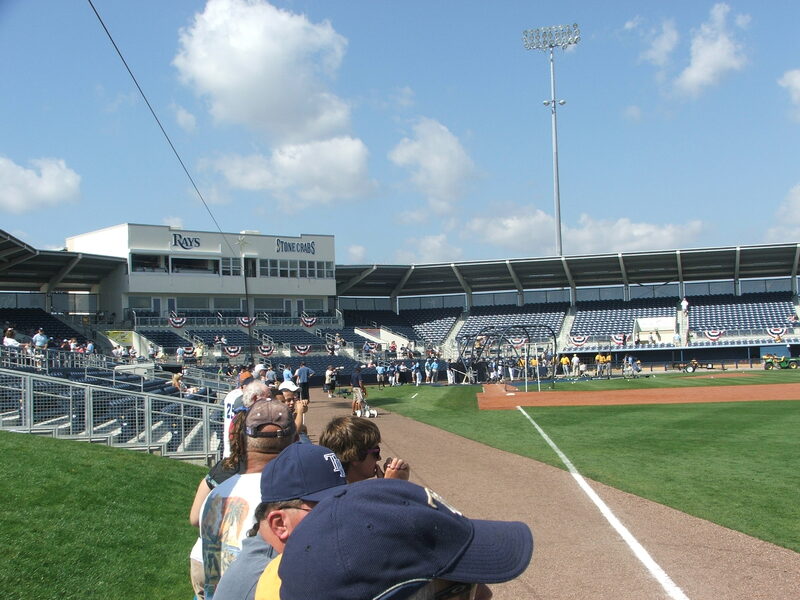 That 2008 Rays team took their motivation from the Spring and it catapulted their bonds and eventually the team came together on the clay and dirt of Progress Energy Park. I still remember the cosmos of emotions that built up within me as we approached that March 23,2008 Spring home finale against the Cincinnati Reds. It was the moment that the Rays offically made their peace with the place that spawned their first game, and ended their romantic trip with the venue that was deep within ther baseball heart each Spring. 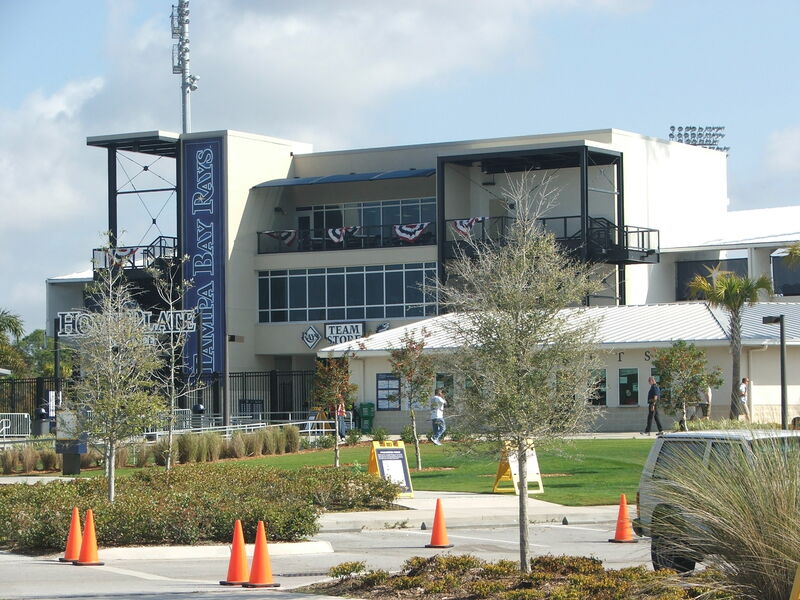 For the next Spring the Rays all converged on a site 78 miles Southward of their Tropicana Field home in the seaside hamlet of Port Charlotte, Florida taking over a refurbished former Spring home of the Texas Rangers. And that last sell-out game held a bevy of emotions that quickly overflowed into the grandstands and grassy berms. Even if the Spring Training game has been now transported to our South, the Rays team taking the field today for this first Spring contest of 2011 know what is ahead of them. With Rays Manager Joe Maddon discarding the mathematics and bringing on the abbreviated, we are entering a new Rays era. “Another Way” is the new mantra, and new fresh mindset of this young re-loading Rays squad. Staying in the “present moment” is going to be key in the way the Rays play this Grapefruit season. Breaking from the untold failures of the Rays recent Spring pasts has been accomplished. This new Spring edition of the Rays will again try and control the controllable from today’s initial game throughout 2011, with an earmark to correcting past inferiors and mental stop signs. The team seems to be focused towards the immediate future, and what each of them can bring to the table. This will defintely be the year of someone different possibly coming to the Rays rescue in 2011 and I commend them for the early acknowledgment of what has to be trimmed and better defined for this team to again taste champagne in October. But I am also a student of the past, and I personally know that sometimes you have to go back to review the past before you confidently step forward. 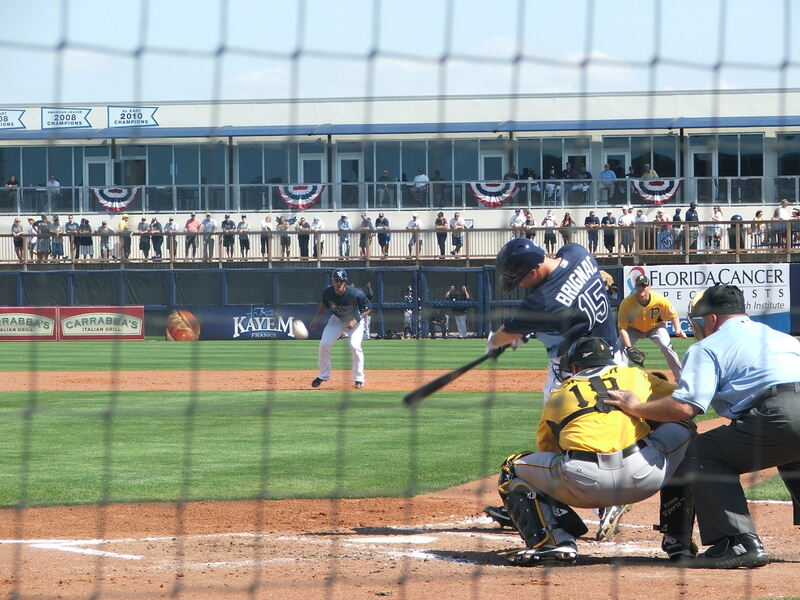 So today as Rays shortstop Reid Brignac steps into the batter box against the Pittsburgh Pirates there will be a heightened sense of renewal in the air in Port Charlotte, Florida. Brignac knows his future is right in front of him, and he is one of the linchpins that will have to grasp each possibility as his last and take this team to another level. Pressure is on, let’s see who is willing to answer the call. There is still the frsh pain smell on the wall of the Rays offices just beyond the Port Charlotte stadium pronouncing the Rays 2010 American League East title. Also in the air this Spring is a renewed crispness that only a great Spring Training baseball game can deliver. Potential meets expectations, just as the bat meets the balls this Spring. The rebirth of the mantra “The Rays Way” expanding into “Another Way” this Spring should help propel the Rays to a possible defense of their 2010 Grapefruit League title heights and great game day results from budding youth and veterans . And with that, it is time to watch some last minute preps toward seeing baseball for the first time in 2011. I am excited, I have been constantly reminiscent of the past over the last few days, and also eager to see the Rays immediate future…So let’s Play Ball! I was so happy to be back at Camelback Ranch to watch my boys of Summer but when I heard about our Duke passing away, I took it very very hard. Ah yes, Play Ball. One of the most beautiful two-word phrases in the English language. Enjoy the sun and all the great baseball! I think “Another Way” is the perfect philosophy for the Rays’s 2011 season, representing future growth and new directions built on the past’s strong foundation. It’s finally here! I wouldn’t worry about being too much of an emotional fan. For me, it’s the memories laced in that makes basbeall so special. I was so taken back by the passing of Duke Snider. He was another of those “bums from Brooklyn( & LA)” that made baseball a romance as well as a game. I always fear for the unfortunate same episode for Don Zimmer as he sees his circle of friends getting smaller and smaller over the years. It is one of the unfortunate events of our lives….we might pass, that should make us cherish and celebrate it more….Duke will be missed, and not by just those in dodger Blue. There is nothing wrong with being a baseball romantic or an emotional fan or whatever you want to call it. For me, baseball is a great game and I love this time of year and the memories that come with it. I know exactly wqhat you mean. The words, “Play Ball” ring in my ears like a Top 40 tune, echoing the same sweet refrain. Makes me giddy every time I hear them before a ballgame. I think Maddon again has a mantras that is simple to remember and not too complex to having guys rationalize or generalize through their thought process. Just like the mathematical 9=8, or 9> 8, this philosophy is grounded in the plain fact that the team is going to call upon a different heroe every night to post a win….Possibly more of a team-grounding experience. I like the way you phrased that….Makes baseball seem to fit like a glove into our lives. Going to have to remember that quote….And I will attribute it to you when I tell the quote. Sometimes it is an emotional wasteland out there. The belief that there is no crying in baseball must pertain to the regular season, because in the playoffs…I have seen tears of joy and pain….on either side of the field. But I agree, the emotional side of this grand gasme can bring all of us to the quantum middle where we can celebrate what we all love individually about this great game.